June 1906. Fillmore & Sutter looking north. Fillmore Street quickly became “the new Market Street” after the earthquake and fire of April 18, 1906, which devastated most of downtown San Francisco. Businesses had to find temporary locations elsewhere, and Fillmore Street was largely untouched by the catastrophe. Businesses crowded into existing buildings, sharing whatever quarters they could find. This photograph, taken two months after the earthquake in June 1906 — exactly 100 years ago — shows Fillmore Street looking north from Sutter. The San Francisco Chronicle opened its temporary office (right) on April 22 while the last embers of the fire were still smoldering. Real estate agents, jewelers, banks, insurance agents, typewriters (typists) and other businesses soon followed. Their temporary signs dominated the street. The Relay tobacco and liquor store on the corner undoubtedly experienced increased business. Michael Schwab is one of the leading graphic artists of our time, in part because of his award-winning logos and posters for Apple, the Golden Gate National Parks and many others. Now his work is coming to the neighborhood: He created the poster and street banners for the 2006 Fillmore Jazz Festival. Music fuels Schwab’s art. He especially likes jazz greats Miles Davis, Bill Evans and Chet Baker. As he stands in his studio in San Anselmo talking about his work, Louis Armstrong is singing “Stars Fell on Alabama” in the background. 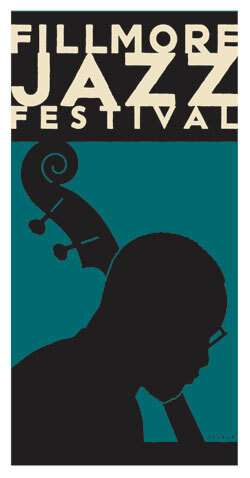 The Fillmore poster depicts a bass player in profile — which is appropriate, since the bass lays the foundation for many jazz bands. But in fact, there is also a more personal element to his Fillmore image. Schwab is himself a musician — “a garage band guitarist,” he says, since his youth. He has long been interested in playing bass, and his wife gave him a stand-up bass as a 25th wedding anniversary gift shortly before he took on the Fillmore job. It stands in the corner of his studio, and it became the model for the Fillmore Jazz Festival poster. Schwab’s work is in the permanent collections of the Library of Congress, SFMOMA and the Achenbach Foundation at the Legion of Honor.